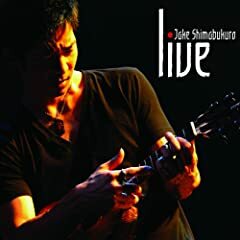 So, pretty much everyone has seen Jake Shimabukuro's "Ukulele Weeps" video on Youtube, right? If not, go do yourself a favor, it's pretty much mind-blowing. What I'm wondering, though, is if anyone has any of his CDs? If so, what's the whole record like? It looks like his latest release is entitled, "Live" and I see that "While my guitar gently weeps" is on there (as is Michael Jackson's Thriller?!). I'm just worried that after a while it will be like listening to soft jazz or something? Or, am I being silly? I really want to like it. In all three of those scenarios, though, I'm impressed! So, I guess what I'm asking is can someone give me a recommendation here? Should I get the live CD or is there a better one? Thanks y'all! If anyone is able to turn one up from another online location, please let me know!